I recall that, when Apollo 11 got back to Earth in July of 1969, Life Magazine was eagerly shifting through the flight photos to find just the right one for their cover. With each passing minute, their concern grew stronger. "Is this Neil?" "No, that's Buzz." "How about this?" "That's Buzz, too." I have a copy of that Life Magazine and, on the cover, Neil Armstrong is a hazy, golden reflection in Buzz Aldrin's helmet visor, a blowup of a photo taken by Neil himself. At the time, it was concluded that there was no photograph of "the first man on the Moon" actually on the Moon because Neil mounted the camera on his spacesuit and never passed the camera back to Buzz and posed himself. Almost twenty years later, after more careful study of the photos, some experts now believe that a photo of an astronaut stowing equipment is, in fact, the first human on the Moon: Neil Armstrong. 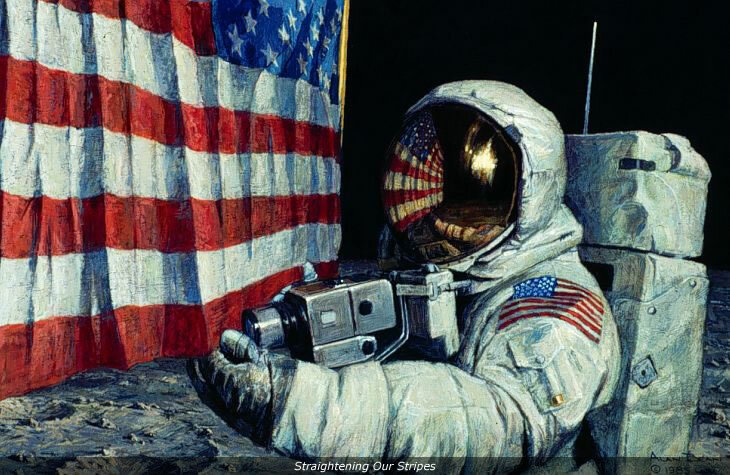 To make this painting authentic, I studied and sketched the television pictures of Neil deploying the flag. I then asked NASA to pose a man in a spacesuit under similar lighting conditions. They agreed and this painting is the result. I painted Neil stretching the bottom of the flag to eliminate creases. The flag had been folded during the flight from Earth to the Sea of Tranquility. Neil said of the flag installation, "It went as planned except that the telescoping top rod could not be extended. It didn't show much." He added, "I was able to stick the flagpole 6 to 8 inches in the lunar dust. The first 4 or 5 inches were fairly easy. After that, it gets hard quickly." Most Americans watching on Earth didn't even notice, we were so happy it was our flag and not one from some other nations.